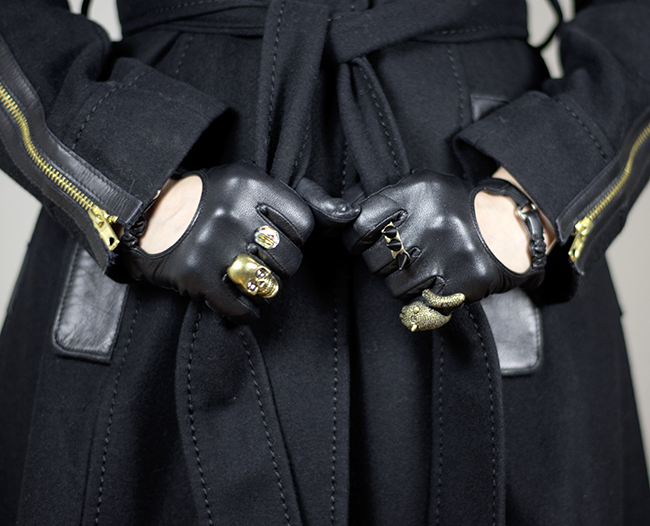 Rings over gloves are too decadent? I say they’re awesome and stylish. 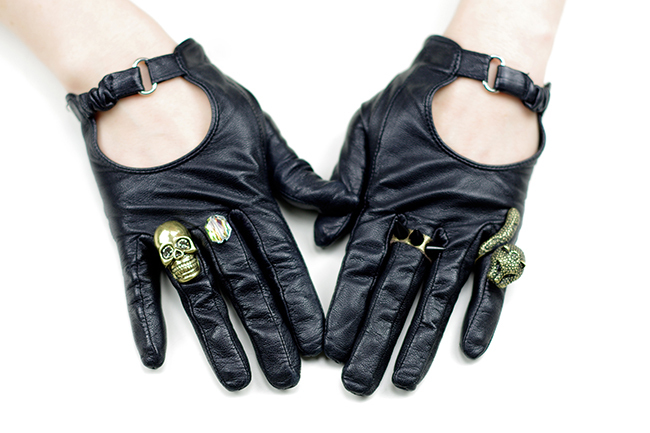 Whether skulls, spikes or rhinestones- more is more is the rule here. 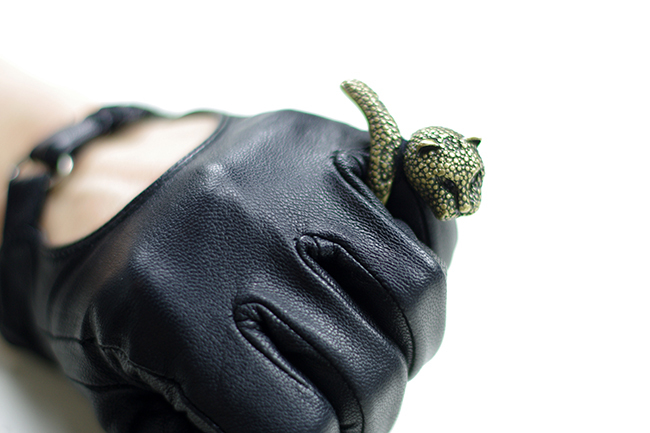 How you decorate the gloves is totally up to you, but I suggest you choose your decoration based on the material of the gloves. 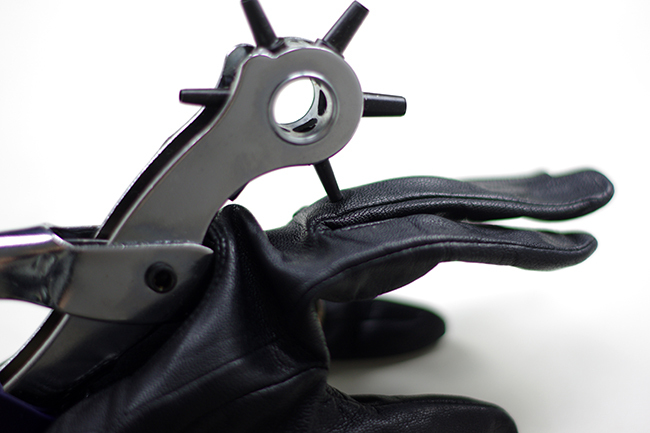 If you use leather gloves, like I did in this tutorial, I recommend you to go with bulky, metallic embellishment. If you pick knitted/fabric gloves I would go with something soft like pearls or rhinestones. One more thing- more is more but still try to avoid too many colors. Otherwise it might look clownish. 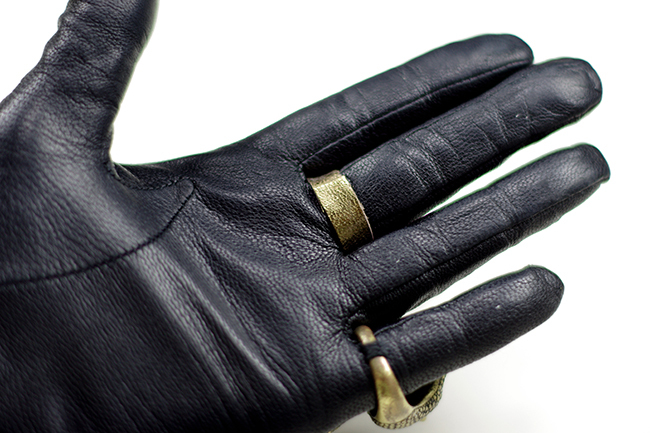 If you take an actual ring as embellishment, pick a ring that is one size bigger than the finger. It is better if the ring sits slightly loose on the finger. Otherwise it will hurt after a while, because the ring is too tight. 1. 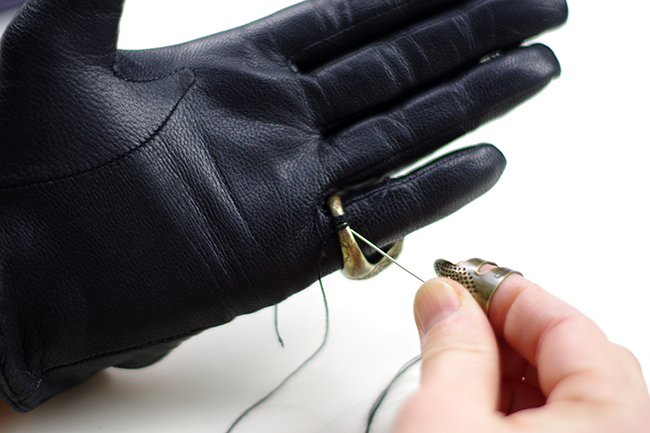 Put the ring on the finger of your choice and attach it to the glove with the thread and needle. The way you attach it depends on the form of your ring. 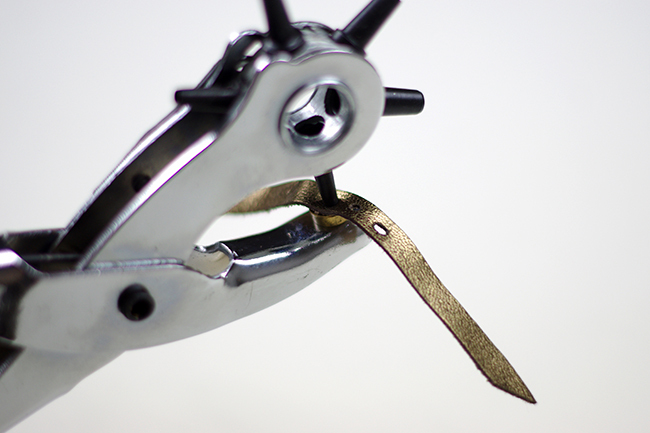 If your ring doesn’t give you much of an option for attachment (because of it’s form), you can simple secure the ring with only couple stitches on it’s bottom. 2. 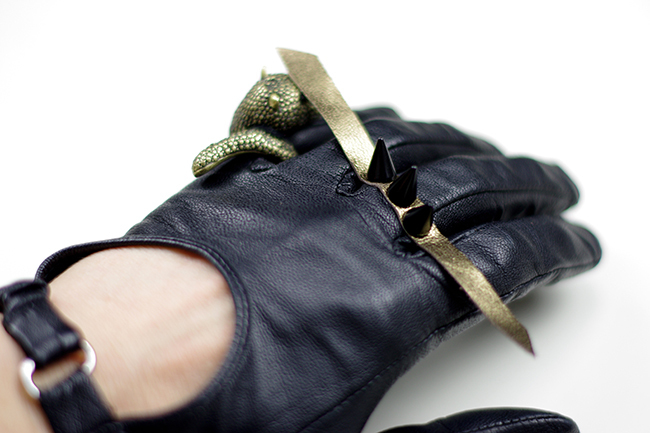 To create the spiked ring cut a thin golden (leather, fils) stripe and punch the holes for the spikes. 3. The punch the matching hole into the finger. Make sure to pick the right spot for the ring- not too high, not to low. 4. 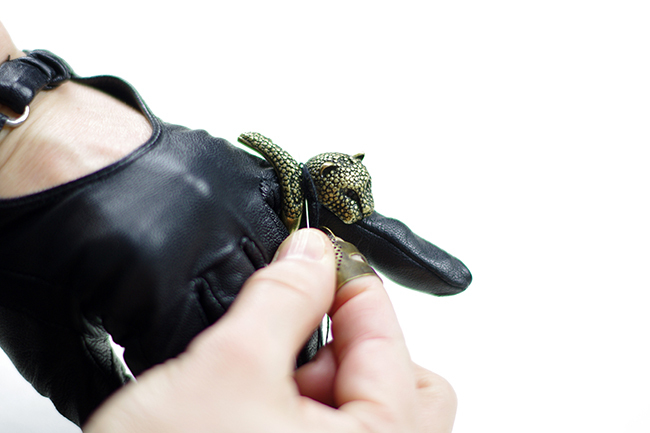 Now attach the golden stripe and the spikes to the finger. 5. 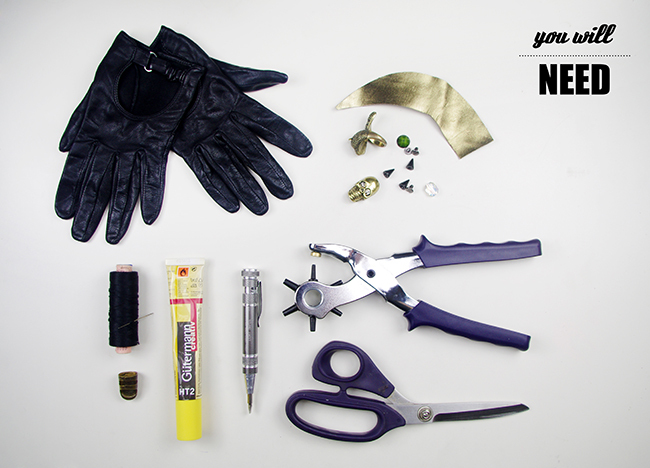 Wrap both ends of the stripe around the finger (not too tight), cut the leftovers and glue the ends together. 6. 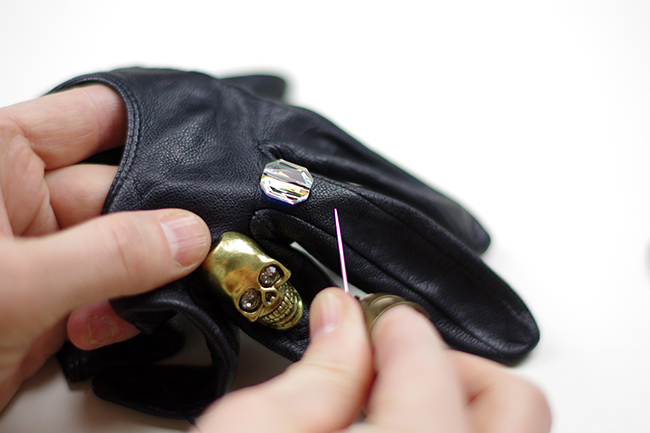 Sew the skull embellishment onto the glove finger. 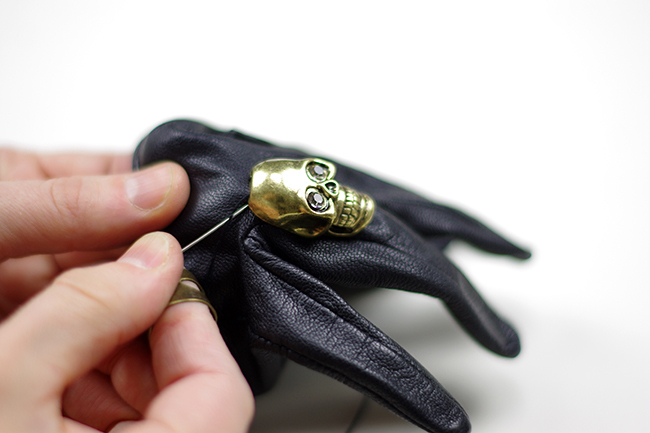 This particular skull used to be part of a cheap bracelet. 7. Attach the rhinestone to the last finger.